GCB662 Jersey number One (Traditional Cache) in Jersey created by Tony, Steve, Dawn & Joy. On the Northern coast of Jersey, Channel Islands. Suggest you park at Position N49 14.829 W002 06.683, From this carpark the coast path is well marked. The cache is just off the path but there is 230 wooden steps from the top of the cliff to the cache point. There are no ramps so wheelchairs or perambulators are a deffinite no no. Cache maintenence carried out. Replaced the original container with waterproof ammo box. Most of the contents water damaged so were removed. 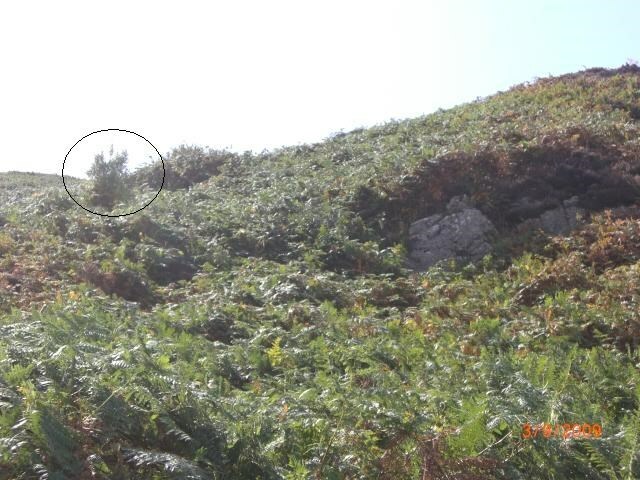 First time we have visited in the summer and I congratulate all those who managed to find it in the bracken. I have added a "Killer Clue" taken from the path. Use this in the last resort. A little cache maintenance, renewed the log books. Cache box is dry, apart from the effort required quite easy to find. Ybpngrq ng gur onfr bs n fznyy gerr. Killer ClueA photo taken from the path of the actual "Small Tree"
View from above the cacheI said the views were worth it. The cache location from the path.